QUEENS, N.Y. -- The University at Buffalo women's soccer team (0-1-0, 0-0-0 MAC) wasn't able to overcome three first half goals by the St. John's Red Storm as they fell 3-1 in their season opener on the road. Kaitlyn Walsh netted the lone goal for the Bulls in the 12th minute as she took a feed from Hannah Callaghan who picked up her first career point on the play. The Bulls came out strong in the first couple of minutes as Kara Daly broke in just 40 seconds into the match and ripped a shot that was saved by the St. John's keeper. Marcy Barberic was able to notch her first shot of the match in the fourth minute but she wasn't able to beat Meredith Reinhardt who notched her second save of the early going. The Johnnies responded to the quick UB start with the first goal of the match in the 11th minute as Christina Bellero sent a cross into the box where Lucy Whipp controlled the ball and beat Emily Kelly on the ground to the corner for the 1-0 lead. Just over a minute later, the Bulls responded with the tying goal as Kaitlyn Walsh took a feed from Hannah Callaghan and broke free at the top right side of the box and blasted a shot into the upper left corner of the net. The assist for Hannah Callaghan was her first career point. 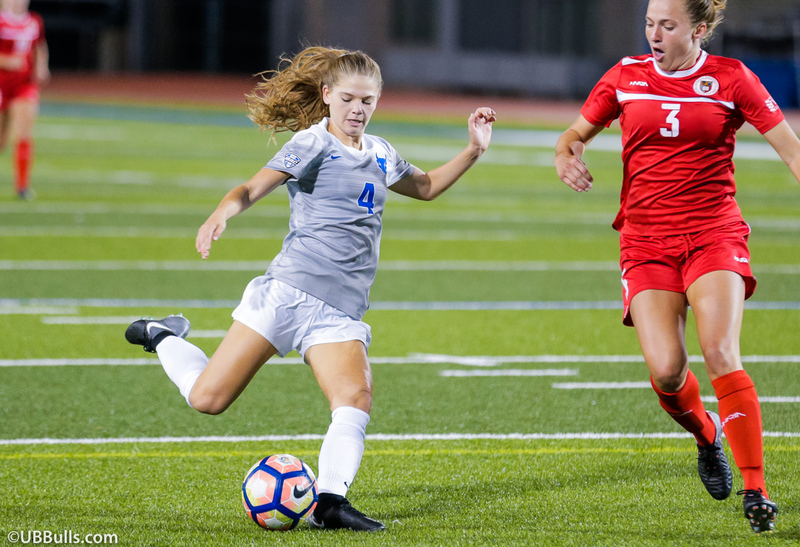 After some back-and-forth play, the Red Storm were able to breakdown the UB defense and netted their second goal of the match as Samie Scaffidi fed a through ball into the box where Zsani Kajan calmly finished off her first goal of the season in the 27th minute. St. John's extended their lead to two, 3-1, just over four minutes later as Lucy Whipp netted her second of the match from just inside the 18-yard box into the upper right corner. The Bulls looked to get within one in the 43rd minute as Carissima Cutrona ripped a shot on goal but her effort was saved by the Red Storm keeper. The Red Storm came out of the locker room with a great chance in the 46th minute as Zsani Kajan ripped a shot off the cross bar and was cleared away by the Bulls, keeping the score 3-1 in favor of the home side. In the 60th minute, Emily Kelly made a strong save to keep the game within reach as Lucy Whipp took a shot but Kelly was up to the test. Carissima Cutrona made a nice run in the 78th minute but her shot was stopped by the St. John's keeper once again. UB had their final scoring chance of the match in the final minute of the match as Kaitlyn Walsh saw her shot attempt saved by Reinhardt. This marked the second match between the two sides with St. John's now owning the 2-0-0 record against the Bulls. Emily Kelly, Hannah Callaghan, Abbey Callaghan and Tess Ford each earned the first start of their careers in the loss. Sophomore Kaitlyn Walsh netted the lone goal for UB in the loss, her second career goal. Freshman Hannah Callaghan picked up her first career point, an assist, on Walsh's goal. St. John's held the 10-6 edge in shots while UB held the 6-5 edge in shots on goal. The Bulls held the 9-5 edge in corner kicks while St. John's was whistled for 11 fouls and UB committed 10. Carissima Cutrona and Kaitlyn Walsh led the Bulls with two shots on goal each in the loss. Meredith Reinhardt made three saves in the win while freshman Emily Kelly made one save in her first career start between the pipes. Head coach Shawn Burke: "Obviously we had some breakdowns that we need to address but we thought the girls responded well and gave St. John's some problems. They were dangerous all night on the attack but tonight was a valuable learning experience for us and especially our newcomers." Following the match, the UB coaching staff selected Kaitlyn Walsh as the Player of the Match as she netted the Bulls goal. The Bulls will return to the pitch on Friday night as they head to Youngstown State for a non-conference meeting with the Penguins at 7:00 pm. Friday night's match will air on ESPN+.